Books about writing books are like finding fresh Mary Sue tracks in the sand. There’s a fine line between “write what you know” and “write what everyone who likes books knows”. Christina Lauren’s Autoboyography bounds twenty kilometres over that line, and there was no way on this Earth I was going to pick it up and read it. If you do not read this book, you are making a grave and unforgivable mistake. Yes, it’s a book called Autoboyography, which is about writing a book called Autoboyography. But. It also manages to bring to a conclusion one of the most emotionally complicated dilemmas I have ever encountered. I remember being two thirds of the way through, seeing how few pages I had left and thinking: how on Earth are we going to get ourselves out of this mess in time? Set in a high school in Utah, Autoboyography follows non-Mormon Tanner as he falls for the bishop’s son, Sebastian. Sebastian is religious, takes solace in prayer, loves his family, loves his Church, is excited about his mission… and Tanner’s crush could destroy all of it in an instant. Unfortunately for them both, Tanner has been tasked with writing a novel in a semester, and Sebastian is the only thing that brings him inspiration. Turning in the novel for a grade would mean exposing them both. Autoboyography explores the ways that romantic, familial and platonic love can both harm and heal, and how they can often do both at once. The tale Lauren weaves is utterly heart-wrenching, and as a reader I felt every impossible choice that Tanner was forced to make deep in my chest. Love can look a lot like madness, and often Tanner finds himself on the brink of wreaking untold chaos in the life of someone he supposedly cares about. The one problem, however, with writing a book called Autoboyography about the writing of a book called Autoboyography, is that you wish the second book was the one you had in your hands. You wish this book was written by a gay man rather than two straight women. Unlike Simon Vs the Homo Sapiens Agenda, which treads respectfully, Christina Lauren left me feeling cheated. Which is a shame, because I personally enjoyed Autoboyography a lot more. Let then this novel be a call to arms. Read Autoboyography. Use Tanner’s story to fuel your novel. Write, write, write. Posted in What I'm Reading and tagged autoboyography, book reviews, gay, lgbt, lgbt books, mlm books. Bookmark the permalink. A lot of LGBT readers have a mountain to climb when summoning the courage to pick up a new book- a mountain of dead gays. The Bury Your Gays trope has its origins in lesbian pulp fiction, but persists across the entire LGBT spectrum to this day, with Out magazine reporting 62 lesbian and bi WLW killed onscreen in just two years. I would therefore forgive people for hesitating before picking up Adam Silvera’s They Both Die at the End . But only briefly. The premise is this: on the day a person dies, they get a telephone call from Deathcast letting them know- this is it. Mateo and Rufus, both strangers, have had their call, and now they need a Last Friend to make their final day special. It goes without saying that the book isn’t a laugh a minute. But Silvera conveys a believable optimism- that it is possible for the right person to change your life in a single day. I must admit to not liking either of the protagonists at first. Mateo is weak, frozen by indecision, and terrified of the death that the front cover deems inevitable. Rufus is selfish and reckless, and his first scene is shocking and repulsive. However, they redeem themselves- or rather, each other. Over the course of the book, we get to learn more about each boy through the other’s eyes, as well as how the world they live in is shaped by the fact that everyone is aware of their impending death. Although one character is gay and the other bi, this goes beyond merely tackling LGBT concepts. Yes, Silvera made the decision to meet the Bury Your Gays trope head-on, but the key themes are death and isolation rather than either character’s sexuality. It pains me that non-MLM readers might overlook this book on account of it being “gay”, when actually it has a lot to say to anyone who has been touched by terminal illness or loss. Both boys are already familiar with death, but that doesn’t stop them from needing to grieve for themselves. They muse on the afterlife while facing the impossible challenge of living their entire lives in a single day. This book is clever, but not pretentious- its concepts are universal, presented from the perspectives of two teenage boys who know no more about death than any of the rest of us. Therein lies Silvera’s genius- none of us have either the time or the answers. We are Mateo and Rufus, and we aren’t going to make it out alive. This book is far more uplifting and inspiring than I ever could have prepared myself for. There’s no getting away from the fact that They Both Die at the End – but so do we all. Posted in What I'm Reading and tagged adam silvera, bisexual, gay, lgbt books, they both die at the end. Bookmark the permalink. When I was a child, I was told if I wanted to watch the film, I had to read the book first. And while I now see this as my mother’s literary pretentiousness, it’s something I now enjoy- and so, upon the release of Love, Simon, I bought myself a copy of Becky Albertalli’s Simon vs The Homo Sapiens Agenda. It’s a comfortable read, told from 17-year-old Simon’s slightly unreliable perspective. Albertalli has succeeded in making a realistically flawed main character who also succeeds in being likeable- Simon is both naïve and nosy, but neither of these things actually caused me to dislike the character. It features a diverse range of supporting characters, which betrays just how much time and effort Albertalli put into researching the book. As a straight woman, she took some criticism for writing a book centred on the coming-out of a gay teenager. However, if the LGBT community declares these topics off-limits to straight authors, we can hardly complain about a lack of diversity. While it is true that we need more LGBT authors, there is no reason why a dedicated author like Albertalli cannot produce authentic stories. Becky Albertalli spoke to a wide range of young LGBT people, and wove some of their experiences into Simon vs The Homo Sapiens Agenda. As a result, the book was littered with moments and feelings that I recalled from my own late teens. Readers with varying orientations will find parts of themselves in the fine details of this story, which encapsulates the tumult of negotiating teenage friendships and crushes. People who have seen the film should be aware that the book differs greatly, often in key ways. Most remarkable (without being a spoiler) is the difference in Martin’s character, as the book takes a lot longer to look at his motives, and as a result he ends up, while still not likeable, far more fleshed-out. I would definitely recommend the book to anyone who wanted to read more about Leah, especially as she is the protagonist of Albertalli’s sequel, Leah on the Offbeat . Although the book was richly emotional, and I found myself crying at points, the overall tone was light, and an ideal read for anyone looking for an escape from the stress of the everyday. Posted in What I'm Reading and tagged book reviews, gay, lgbt, lgbt books, love simon, simon vs the homo spaiens agenda. Bookmark the permalink. A Girl In Winter is set between a summer in Oxfordshire and a frozen January in somewhere desolate, presumably Hull. I do not mean that Hull is desolate, just that there is library in the story, and Philip Larkin (the author) was a librarian in Hull for many years. So, as I’ve stated, A Girl in Winter was written by Philip Larkin. Yes, the poet. The one who wrote This Be the Verse. You do know it. “They f*ck you up, your mum and dad”? See, you did know it. If you didn’t, don’t worry, I have it by heart, or you could just google it. A Girl In Winter is not like that. It follows the twelve hour day of Katherine Lind, a “foreigner”, whose providence is never explicitly stated. During it, she remembers the summer she shared with a boy called Robin Fennel, a delightfully boring sort of boy who she was in love with for four days many years ago. Descriptive passages were phenomenal. Of course, it helped that I read the book largely in the precise section of Oxfordshire described in the novel, and at the height of a beautiful summer heatwave too, but even the frosted-up windows of the bus Katherine rides with Miss Green and the darkening library at closing-time were vivid in my imagination. I do not, as a rule, enjoy extensive description. I chase after the action. Still, I enjoyed the novel thoroughly. Characters were realistic, motives were plain and while I wouldn’t go so far as to call it sad, it is certainly rarely cheerful. Anstey strikes me as the sort of man I should like to push down a flight of stairs and hope he hit his head too hard to testify. Miss Green is a spoilt little girl. Robin Fennel is ordinary, Jane Fennel is strange and Katherine is impotent, an outsider always. They all sit neatly upon their little wheel and play out their parts perfectly. I was going to talk about the ending, but I won’t. I liked it. You may not. It’s an interesting one. My recommendation is to the curious- many people do not know that Larkin wrote novels, probably because he wrote just two. Then again, many people know Wilde wrote novels, and he only managed one. A Girl in Winter is a slow read, perfect for eating up the hours on a long journey (not if you’re the driver/pilot) or, if you have time for such things, reading on a cold day indoors. Not one for thrill-seekers or the sentimental. Posted in What I'm Reading and tagged a girl in winter, larkin, novel, philip larkin, reading, review, what I'm reading. Bookmark the permalink. Strictly speaking, I’ve finished reading it, but it’s not a review per se. Sarah Waters is well-known for her historical novels, which all touch, in some way or another, on lesbian themes. They are exciting, well-researched and actually treat women like humans capable of sexual desire, rather than just being objects of it. So, after reading Tipping the Velvet and Fingersmith, I was highly curious as to what a Sarah Waters novel was doing on my 14 year old cousin’s bookshelf. A quick look inside established that the book had been acquired from a charity shop, rather than sought out. I slipped it out and rearranged the bookshelf to make it less obvious I had removed something. I’m not out to my family because I’m a spanner. I’m not ashamed, I just find it difficult rather to explain that I’m not a lesbian, and that there are alternative explanations for my interest in lesbian film and literature. I liked Tipping the Velvet. I saw the BBC adaptation first, but thoroughly enjoyed the book too, much preferring the book incarnation of the main character, Nan. That’s not to say the TV version isn’t worth a watch, because it very much is. Off the top of my head, it has Keeley Hawes, Benedict Cumberbatch and Johnny Vegas in it. Fingersmith was less good. It was a riveting, complex plot, filled with duplicitous characters, but felt very much as if lesbianism had just been shoehorned into it. It might just have been me, but the ending left me feeling more than a little awkward. So, I wasn’t expecting much. Doctor of English Literature Waters may be, but the vast majority only have one good novel in them. As Fingersmith wasn’t half as good as Tipping the Velvet, I was expecting The NIght Watch to be only a quarter as good as Fingersmith. I am glad to announce that I was wrong. Set, to begin with, in 1947, it marked a departure from the Victorian novels that I had read, which was a pleasant surprise. There were four central characters, all with enormous secrets, and it was engaging to try and work out the connection between the four of them, and what these secrets might be. As the novel moves on, it also moves backwards, before climaxing in 1941. Yes, that does preclude a happy ending, which bothers me only because I haven’t read one for quite some time. But it was really interesting to look at these stories as having a resolution, not for the character, but for the reader. For example, the character of Duncan is first introduced as an anonymous young man being watched from a window by Kay. So much of his story is told from the perspectives of others, that I felt, as a reader, compelled to make the same assumptions that other characters made of him. I wouldn’t say I was pleasantly surprised by the climax (read above re: no happy ending), but as a reader, I found it utterly compelling to the last. In some ways, The Night Watch is better than Tipping the Velvet, because it reads simply as a novel, and not a “lesbian novel”. I would recommend it therefore, to anyone who is not particularly squeamish- set partially during the London Blitz and subsequent offensives. There are also some nastily graphic scenes which I cannot spoil, but just take note that this book is honest and brutal and sad. Chapter lengths make it sometimes a tough read, but the prose is easy enough to follow. Just remember to stop when there’s a change in point of view, rather than trying to continue to the end of the chapter, because you will be exhausted. So, yes. Utterly recommended, to men, women, straight, gay or anywhere in between any of the options. Just not people who faint at the sight of blood or desperately need happy endings. Posted in What I'm Reading and tagged fingersmith, gay, lesbian, lgbt, novel, reading, sarah waters, the night watch, tipping the velvet. Bookmark the permalink. When you meet your favourite book, or film, or (although I cannot speak from experience on this one) wine, it is said that you know immediately. So it was with me. Both my favourite book, Catch-22, and my favourite film, The History Boys, were discovered within months of each other. Perhaps it is just coincidence, or perhaps it is because fourteen is such a formative age, that merely consuming something half-way intellectual imprinted on me indelibly. I would rather it was the former, in all honesty, but cannot say for sure. Unfortunately, I discovered my favourite song by listening to the History Boys soundtrack, which rather suggests that the other theory Is true. I had hoped that my taste would amount to something more than circumstance, but perhaps it is one of those things about human nature that can neither be explained nor understood. One afternoon, most likely a Friday, we were led away from our usual lesson to the library. We were apparently not reading enough as a form, and were required to take out a book. I had, for most of my childhood, been an avid reader, but had consumed so many stories that I became easily bored. We were given a time limit to find something to read, and as the minutes ticked away, I was the only student left staring blankly at the shelves. English teachers liked me, because I liked their subject, and had a broad vocabulary and strong grasp on language that made their marking easier. I liked them simply because they liked me. My teacher took pity on me, and handed me a copy of Catch-22. It did not appeal. My teacher was an ex-army man, and it was understandable that he should recommend a book set in World War II. However, I had no such interest. Admittedly, I was an Air Training Corps cadet, but it was the flying, and not the fighting, which enticed me. Still, I was obedient, and read. At the end of the lesson, we were called upon in turn to share what we had read. The look on my teacher’s face suggested that he, too, was surprised. I later discovered that he had recommended the book solely on the merits of the film adaptation, shame of an English teacher that he was. In it, apparently, there is no mention of falling madly in love with chaplains, however briefly. I quickly became lost in the novel, and forgot all about the incongruous opening. Indeed, it was a full twelve chapters before I even got my bearings, and try as I might I can never enjoy again that experience of everything settling finally into place. I tend to resist re-reading it in the hope I will forget, but it does not work. The second time I read it, at sixteen, I was bothered not at all by the Chaplain, nor why Yossarian should be, for a few pages at least, in love with him. I suppose I had not waited long enough for a re-reading. However, this third time, it has bothered me immensely. In good storytelling no word is ever wasted, and if I believe, as I do, that Catch-22 is the greatest story ever told, then no word of it, least of all the two opening sentences, can be discounted. 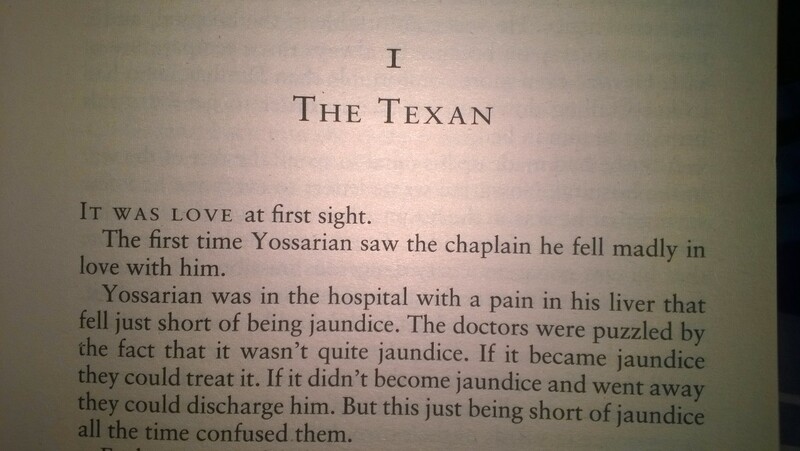 So, why do we need to know that Yossarian is in love with the chaplain? I’m afraid I don’t have a dinky little answer to trot out for you. I’ve certainly read a few, but they sounded hollow. I don’t, for example, believe that Heller sought to delineate the difference between homosociality and homoromanticism. It’s a nice theory, certainly, but not really supported by the rest of the book. The opening sentences can’t just be taken out of context. Other essays suggest that it is merely a humorous device, but I think they forget what it says about Yossarian’s character. My problem in all this is that I’m not sure what it says about Yossarian’s character, except that I know that something is said. That was the first sentence I read about Yossarian, and first impressions are hard to shake off. Unfortunately, this is all subconscious, and I would quite like to know consciously what I feel about Yossarian. I have had other epiphanies on this reading. I realised that Yossarian appeals to me because he is a coward of sorts, and so am I. It’s kept me alive thus far and I have no intention of changing my ways. I noticed sentences I do not remember noticing, but maybe that is just my insistence on waiting. It also upsets me to know I will probably not read this book again until I am thirty, because I find that I am having the most fun I have had in reading for a very long time. I think I know now why the opening two sentences stand as they are. And I am sorry I ever looked to someone else’s opinion for answers. Because all that matters to me is mine, and all that matters to you is yours. I do not intend on sharing my theory. To do that satisfactorily, I would need to go back, pick out quotes, and in doing so inadvertently memorise a book I have spent six years trying to forget. In reality, my theory is so stunningly simple it would be upsetting if I just come out with it. So I won’t. Go. Read. Come to your own conclusions. Posted in What I'm Reading and tagged catch 22, joseph heller, novel, reading. Bookmark the permalink.